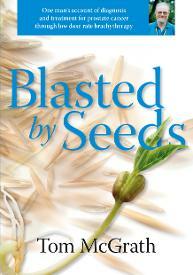 Blasted by Seeds is Tom McGrath’s story of his experience with prostate cancer — the tests, biopsies, diagnosis, and the difficult process of choosing a treatment. Tom never suspected he had cancer, until a chance blood test returned an atypical result. He soon found himself in a urologist’s surgery discussing the early stages of the disease. This book details the brachytherapy procedure Tom underwent, and the long post-op period of medication and testing. A central theme of the story is how he ‘gets on with life’ in spite of a potentially fatal disease. Tom McGrath has had a varied career, including factory inspection, trade unions, parliamentary research, and teaching. He is a contributing author to books on employment relations and human resource management, and recently taught New Zealand Diploma in Business courses at a private training institute. Tom’s recreational interests include Latin American dancing, mountain biking, and swimming. He is married to writer Julia Millen. Great interview by Martin Johnston of the NZ Herald with Tom about his experiences with prostate cancer.